History Enthu Cutlets, Have You Visited This 17th Century Masjid Yet? 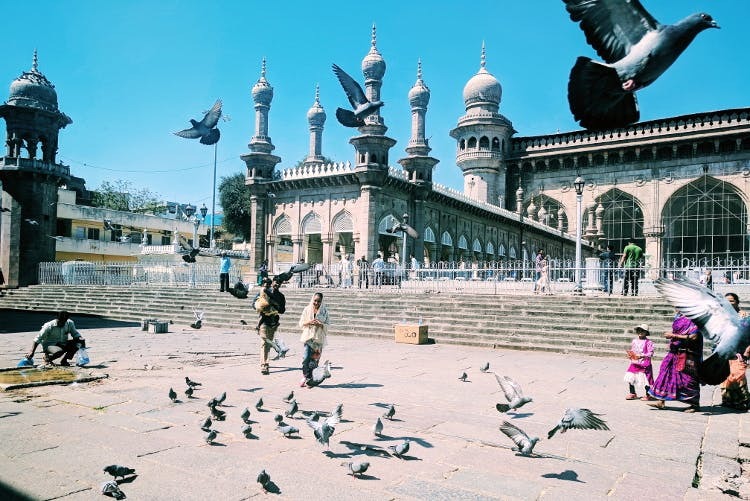 Mecca Masjid in Hyderabad is a well-known monument of significance and you can spend a few hours here observing the larger than life architecture. Have a tête-à-tête with the pigeons flocking at the entrance of the mosque and step inside to observe the beauty of its architecture. Located close to Chowmahalla Palace and Charminar, this masjid was built during the reign of Quli Qutb Shah. It is said to accommodate over 10,000 members and from the masjid, you can get a brilliant view of the Charminar and Osmania hospital. While touring, you'll discover enchanting doors and arches with inscriptions from the Quran written above. It has an elaborate staircase at the entrance where you can relax and take in your surroundings. After this, you can head out to Nimrah Cafe for a cup of Irani chai. While you are not allowed to carry your DSLRs inside, you can photograph the architecture with your phone. But be sure to not photograph the prayer area.